I am delighted beyond words to announce that I’ll be hosting a live chat with Brian Weiss, who is a Managing SEO consultant with the premier SEO agency, Stone Temple Consulting. I follow owner and lead consultant Eric Enge like a puppy because he does THE best testing and SEO predictions based on that testing. I met Eric through Mark Traphagen, who is now Stone Temple’s head of social media and marketing. Mark and I first on G+ when he was posting heavily about SEO and I’ve been a loyal follower of his ever since too. Last week Brian and I had a pre-interview chat to go over the long list of questions and topics I have for him, and to better acquaint him with who my followers are so he’ll be able to give responses based on our needs. That’s important because Stone Temple typically works with big agencies. And the needs of SEO for solopreneurs with training and products and craft/lifestyle/food bloggers who run ads for revenue can be slightly different than what bigger brands need help with. So, we’ll covering the burning questions that affect us the most including things like what to do with old content, 404s, redirects, anchor links, and emerging SEO ranking factors. Mark your calendars now to join us live on Wed Jan 24 at 1pm ET / 10am PT. And go see the post for more details. My chat with Brian also gave me insight into more info to share in the first DIY SEO Workshop that we did last week on Technical SEO. That is the very foundation of your SEO, and we spent time in the Jumpstart Challenge prior to the first workshop ensuring that we had the basics setup. Then in the workshop, we went even deeper. I’ll be making updates to the workshop replay notes this week, based on things Brian told me. And we’ll have a live bonus session on Wednesday to highlight those changes and updates to the info. Proper image optimization is THE biggest bang for the buck you can get for faster page load speed. And nothing holds a candle to doing real optimization prior to upload. Those plugins you may be using to help with that – forget about it! Most of them don’t even work well. And to prove it, and to help my site audit clients learn a better way to optimize their images, I made a little video tutorial. 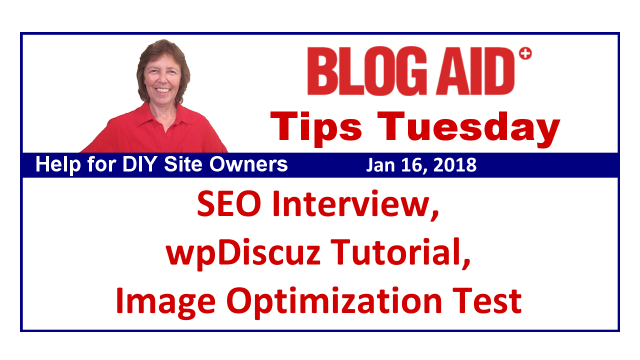 I show you where to find THE best image optimization tutorials I’ve ever seen, plus how to run real tests to see if your optimization strategy is working. I’m steadily working through my backlog of tutorial posts for the public and my member sites. I’ve already got a draft post on the wpDiscuz plugin. This was one of my top winners in my head-to-head tests of the best comment reply notification plugin tests. But, before I publish this one, I sent a draft of it out to all the nice folks who helped test these plugins. This was a tough tutorial to write because wpDiscuz has a TON of settings. I couldn’t cover them all, so I wanted to make sure I got all of the really important ones. So, look for that post to publish on Thursday. I’ve also started the new tests on WP Rocket, which is a super duper caching plugin. This past summer they changed their whole interface. And ever since they’ve been adding more features. I definitely want to see about using some of those new features on BlogAid and especially for the new pages I’ll be creating in my site revamp. One of those is turning videos into thumbnail images for better load time. I hope to create a new video gallery page, and faster load on it will be super. There are other new lazy load features I’m testing now too. I’ll have a review post for the public and then an in-depth test results and settings post for my Webmasters as soon as I finish all the testing. So, keep an eye out for that. I’d like to strongly encourage all of my webmaster training peeps to read this post with the latest changes to Gutenberg. We have enough development going on now to start working with it and getting more familiar with the backside. That’s especially true for designers who will be styling blocks for it when the new, fully Gutenberg compliant themes start coming out later this year. Right now is the best time to dive into it, as it’s all still fairly simple and everyone is still learning. So, there are lots of posts and conversations at a beginner’s level with it. If you have questions, you’re a lot more likely to get an answer while these posts are fresh. I’ve started a new Gutenberg section in Level 1 for you too. For Level 6 folks, I sure would appreciate you posting links in our Facebook group to posts you find helpful too. I’ll include them in our Gutenberg section. I’ll also be gleaning the best and most helpful resources listed in this WPTavern post with a roundup of Gutenberg resources and conversations too. FYI, I’ll be making other updates to Level 1 this week and removing some tutorials that are either old or are no longer needed. I’ll have an update to the Changelog and an email out to you when those are complete. For site owners, I’m still advising that you don’t install the Gutenberg plugin now, and that you don’t switch to it when it rolls into the core in WP 5.0, whenever that becomes available. There is already a Classic Editor plugin that we’ll be using when that happens so we can carry on as usual. We won’t be making use of Gutenberg until we switch over to fully Gutenberg compliant themes. And I don’t expect those to be available until at least 2019. So, nothing for you to concern yourselves with it at this point. Having a properly generated XML sitemap, and having it active on the right site property in Google Search Console is now more important than ever. Barry Schwartz reports on Search Engine Roundtable that Google is indeed using your XML sitemap to determine your canonical URL. Our XML sitemap and proper Search Console settings is what we’ve been laser focused on in the first DIY SEO Workshop too. One of the other elements we checked was the setting for the preferred domain. In the setting itself, Google only says it affects whether your domain in search appears as www or not. But thanks to feedback from member Krishna De, she relayed a copy of the text in the email Search Console sends out after you make that settings change. The email states that Google will use that choice to tell its bots what your canonical is. So, Google is obviously taking clues from multiple places to figure out what your real canonical URL is for your site and what should be considered the primary for all of your links, no matter what version of it those bots find around the web. One of the other elements we’ve been focusing on in the Workshop is what’s in your sitemap. You could be telling Googlebots to crawl and index something that doesn’t warrant indexing, or you could be blocking it with something like robots.txt. That last one really confuses the heck out of Google. Stone Temple Consulting is hosting the Next10x Conference soon. And while most of us will not be in attendance, I think you’ll get a lot out of reading what’s on the agenda. That list is a super head’s up about how our current marketing strategies are changing and what’s next on the horizon. You’ll also want to check out the speaker roster, as there are a LOT of great visionaries and leaders in the industry for you to start following, if you’re not already. Here we go with folks chasing the dragon in earnest. Google’s PageSpeed Insights has finally added speed scores to their results. They are supposed to show real load time to actual visitors. They are gathering the info from folks who use Chrome. The caveat is, most folks probably don’t have that share info feature turned on and thus, are not sharing the load times of the sites they visit. So, if you give this thing a try, just know that there probably isn’t enough data to make the results worthwhile, if there’s even enough data collected on your site to show at all. There wasn’t for BlogAid. And the last line of this post just kills me, especially with Google’s focus on mobile-first indexing. And even if it’s true, speed still matters like crazy for halting early abandonment and getting more conversions. If you do give this a go, try one of your blog posts instead of your home page. If you’re doing your content marketing right, your blog posts are what folks will see first on your site, and it’s where most all of your conversion points are too. Plus, it will have a lot more elements to load and be a better indicator of speed for your site. No matter what result is, I still consider PageSpeed Insights to be one of the least accurate, least helpful performance testing tool available. But that certainly doesn’t stop site owners from chasing the dragon and wanting a perfect 100 score on it. They are going to deduct 15-20 points each if you are not using AMP or SVG images. So if your score is at least in the 60s to 70s, you’re okay. Below that, holler at me for a site audit. This is not exactly site related, but I know a lot of you use MailChimp. This weekend I noticed a change to their campaign creation workflow. And about time too, as MailChimp has always had a goofy way of doing stuff and required way too many clicks and pages to go through to create a campaign. It’s all in one flow now and a lot more intuitive once you do one and know how it works. Share this post with all your blogger buddies! It’s a great way to support all the free content I make available.